I recently wrote a blog for a client whose business is relatively new on the social media scene. I really like this client. He’s got integrity and runs a customer-centric business, shoots from the hip and is pretty much the salt of the earth. I love helping him gain traction online. That’s not an overnight process for any business, especially those with a product or service that doesn’t have built-in virality. His doesn’t. What do I mean by built-in virality? Let’s look at bacon. 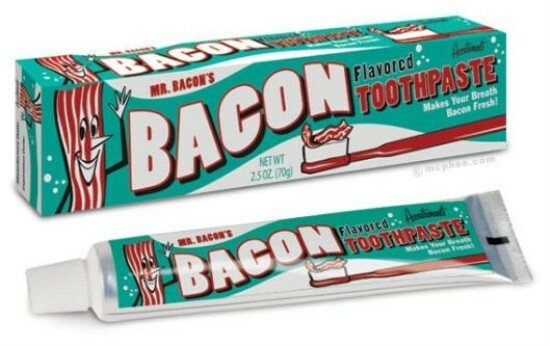 Chocolate-covered bacon, bacon-flavored toothpaste, rose-shaped bacon bouquets—bacon is the new black. There are whole Pinterest boards dedicated to it. It’s got a super-active hashtag on Facebook. This helps explains why a company that sells a little ho-hum bottle of seasoning called Bacon Salt has more than 70,000 Facebook fans and grows its numbers every day. Bacon Salt issues more bacon-related humor, trivia, pictures, recipes, and contests on its page than you can shake a stick at, and people flock to it like—well, like people to bacon. That’s what I mean by built-in virality. Our client does not sell bacon. He sells bathroom-remodeling services, and as far as I know, does not yet offer bacon-patterned tile (though I’m sure someone does, or now will). Building a social-media following for him takes more than slapping on a #bacon hashtag and letting nature take its course. So, to help get his blog noticed and shared, I sometimes move outside the narrow confines of bath remodeling and instead write about topics with built-in virality. I call this riding the bacon—as in riding on the coattails of something with broad public appeal. It works. In this client’s case, riding the bacon meant writing a blog about the proper way to orient toilet paper rolls. Why? Because about 90 percent of people have an opinion on the matter, many of them a fervent one. You believe in a right and wrong way to do it, too, right? And you’re kind of wondering what the blog said, right? How do I know that? Because toilet-paper orientation was perhaps the most contentious, comment-generating topic that Ann Landers ever discussed in her infamous opinion column, which spanned several decades. In other words, the topic has built-in virality. It wasn’t a huge leap from our client’s area of expertise—bathrooms—so it still made good use of bankable keywords. The topic got more people commenting, liking, and sharing the blog than ever via Facebook. In other words, it put our client’s business in front of more people and got them engaged. Win! The social media world is a little bit like a giant cocktail party, and folks like Bacon Salt have it pretty easy at that party. They can freely talk about what they do or sell knowing it will naturally draw a crowd. Folks like my client don’t have it quite as easy. They have to mix up the conversation more, lest they become a buzzkill or that creep by the punch bowl who keeps trying to sell me something. That’s why it’s so important for business owners to trust your hired bloggers to talk about broader topics. For some businesses, it’s good to ride the bacon now and then!